From the Seattle Post-Intelligencer NORTHWEST TODAY section of Sunday, October 10, 1965.
lay group has meaning for all. Rev. Peter S. Raible of the University Unitarian Church stirred quite a controversy recently when he delivered a sermon called "The Shame of Seattle." I think the sermon deserves further comment. There is something of import in it for all citizens. It should have par­ticular significance for men of good will whose practice of their religion is a sign that they recognize their responsibilities to God, their families, and to themselves. Yet any of us is vulnerable to confusion when it comes to clearly defining the ex­tent of those obligations. 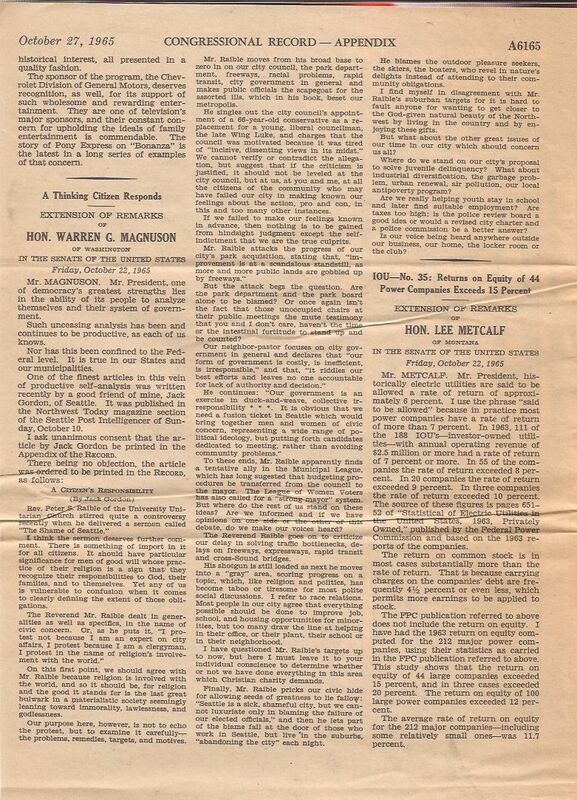 The Rev Mr Raible dealt in generalities as well as specifics, in the name of civic concern. Or, as he puts it, "I protest not because I am an expert on city affairs. I protest because I am a clergyman. I protest in the name of religion's involvement in the world." On this first point, we should agree with Mr. Raible because religion is involved with the world, and so it should be, for religion and the good it stands for is the last great bulwark in a materialistic society seemingly leaning towards immorality, lawlessness and Godlessness. Our purpose here, however, is not to echo the protest, but to examine it carefully -- the problems, remedies, targets and motives. Mr. Raible moves from his broad base to zero-in on our City Council, the Park Department, freeways, racial problems, rapid transit, city government in general and makes public officials the scapegoat for the assorted ills, which in his book, beset our metropolis. He singles out the City Council's appointment of a 66-year-old conservative as a replacement for a young, liberal councilman, the late Wing Luke, and charges that the Council was motivated because it was tired of "incisive, dissenting views in its midst." We cannot verify or contradict the allegation, but suggest that if the criticism is justified, it should not be leveled at the City Council, but at us, at you and me, at all the citizens of the community who may have failed our city in making known our feelings about the action, pro or con, in this and too many other instances. If we failed to make our feelings known in advance, then nothing is to be gained from hindsight judgment except the self-indictment that we are the true culprits. Mr. Raible attacks the progress of our city's park acquisition, stating that, "improvement is at a scandalous standstill, as more and more public lands are gobbled up by freeways." But the attack begs the question. Are the Park Department and the Park Board alone to be blamed? Or once again isn't the fact that those unoccupied chairs at their public meetings, the mute testimony that you and I don't care, haven't the time or the intestinal fortitude to stand up and be counted? Our neighbor-pastor focuses on city government in general and declares that "our form of government is costly, is inefficient, is irresponsible," and that, "it riddles our best efforts and leaves no one accountable for the lack of authority and decision." He continues, "Our government exercise is an exercise in duck-and-weave, collective irresponsibility . . . It is obvious that we need a fusion ticket in Seattle which would bring together men and women of civic concern, representing a wide range of political ideology, but putting forth candidates dedicated to meeting, rather than avoiding community problems." To these ends, Mr. Raible apparently finds a tentative ally in the Municipal League, which has long suggested that budgeting procedures be transferred from the council to the mayor. The League of Women Voters has also called for a "strong mayor" system. But where do the rest of us stand on these ideas? Are we informed and if we have opinions on one side or the other of this debate, do we make our voices heard? The Rev. Raible goes on to criticize our delay in solving traffic bottlenecks, delays on freeways, expressways, rapid transit and cross-Sound bridges. His shotgun is still loaded as next he moves into a "gray" area, scoring progress on a topic, which, like religion and politics, has become taboo or tiresome for most polite social discussions. I refer to race relations. Most people in our city agree that everything possible should be done to improve job, school and housing opportunities for minorities, but too many draw the line at helping in their office, or their plant, their school or in their neighborhood. I have questioned Mr. Raible's targets up to now, but here I must leave it to your individual conscience to determine whether or not we have done everything in this area which Christian charity demands. Finally, Mr. Raible pricks our civic hide for allowing seeds of greatness to lie fallow: "Seattle is a sick, shameful city, but we cannot luxuriate only in blaming the failure of our elected officials," and then he lets part of the blame fall at the door of those who work in Seattle, but live in the suburbs, "abandoning the city" each night. He blames the outdoor pleasure seekers, the skiers, the boaters, who revel in nature's delights instead of attending to their community obligations. I find myself in disagreement with Mr. Raible's suburban targets for it is hard to fault anyone for wanting to get closer to the God-given natural beauty of the Northwest by living in the country and by enjoying these gifts. But what about the other great issues of our time in our city which should concern us all? Where do we stand on our city's proposal to solve juvenile delinquency? What about industrial diversification, the garbage problem, urban renewal, air pollution, our local anti-poverty program? Are we really helping youth stay in school and later find suitable employment? Are taxes too high; is the police review board a good idea or would a revised city charter and a police commission be a better answer? Is our voice being heard ANYWHERE outside our business, our home, the locker room or the club? 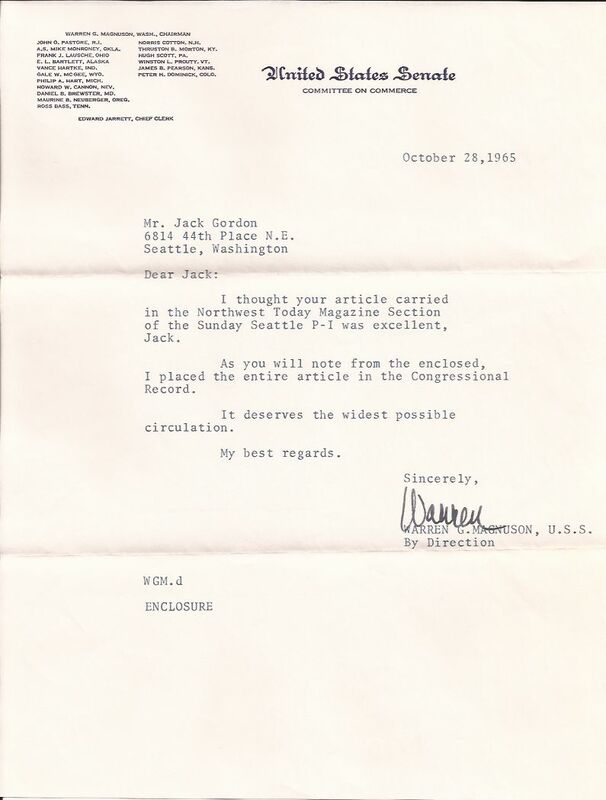 Two weeks later, Gordon's article was read into the Congressional Record by U.S. Senator Warren Magnuson.